Staying fit and healthy is a primary goal of many including myself. It was a couple of years ago now when I looked in the mirror and said to under my breath ‘I need to change this’. I wasn’t fat but I was unhealthy. Poor posture, terrible diet and low energy levels were all contributing factors to how I began to feel about myself. Before any social event I would spend an hour getting ready; not because I needed to but because I was unhappy with the way I looked. Since then I made a few choice changes in my life. I began to work out regularly, I explored other more exciting things to do with my time other than drinking and finally I got a grasp of food and how to maximise what my body gets out of food. Most of this was down to working from home and how it made a better human out of me. The reason many don’t exercise or the reason they ‘claim’ they don’t exercise is due to time. Finishing work at 5-6pm and then driving to the gym, getting changed, exercising, showering and then driving home is tough especially in the winter. It’s the sole reason why many palm the gym to one side in place of the home comforts of a TV dinner and their favourite trashy TV program. This was the MAIN reason why I switched to home workouts. Having the opportunity to work within your own conditions is priceless. Similar to working from home if you’re a well focused individual the benefits far outweigh the negatives. Your time is precious especially the time you allocate to the gym. If you have a set time of an hour a day due to commitments elsewhere then that time is essential. Gym crowds ruin any gym flow you may have as they mean you have to switch up your routine or wait for equipment. There’s nothing worse than gearing yourself up for a legs workout to see the squatting rack busy. Having equipment at home can negate this feeling of dread as there will be only you and your other family members who use the equipment. Even as a gym regular I felt the intimidating/judgemental nature of the gym environment. There’s always someone who will be judging your workout. Furthermore if you’re just starting out then it can be a daunting place and you will find yourself compromising your workout to purposely stay away from the ‘gym regulars’ . Working out from home allows you to create an environment you are comfortable with; one without intimidation. This should vastly improve your work out too as you’re not surrounded by individuals who are impacting your workout. Most people want to stay fit, stay active but fit this around the lifestyle they want to lead. The modern day individual is extremely busy and fitting in the gym is a difficult task. Working out from home allows this to your schedule. Work shifts and want to work out when you return home? No problem. Want to work out on Christmas day? Go for it! In all seriousness although many gyms are now accessible 24/7 they still don’t allow you the flexibility a home gym affords. Direct debits and monthly payments are easy however they never allow you to have financial breaks. As long as you have direct debits you are committed to those payments for the period they run. Phone bills, car insurance and gym memberships are regular monthly payments found on bank accounts across the globe and by paying up front you make a long term investment over monthly non investment based payments. But the gym has more equipment? How much do you realistically need? If you’re keen on cardio buy a great treadmill or run outside. If you enjoy weights then you can get a great setup for the cost of a years worth of gym membership. My home gym has thus far cost me 11 months worth of gym membership with extra additions on birthdays and christmas. By paying up front or using a birthday/christmas to acquire gym equipment you can reduce direct debits by cancelling gym memberships. Furthermore you will have the long term ownership of gym equipment. If this is in the form of steel weights then they should last forever (give or take technological advances). The gym is a social breeding ground. People are having conversations, music is blaring, guys are grunting. It’s not the best place for concentrating on your workout. 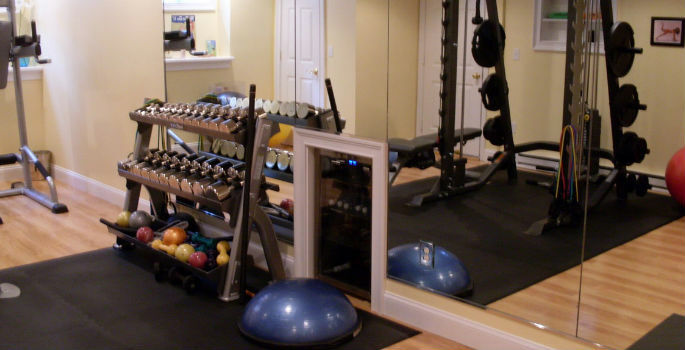 If you’re focused on your workout goals then the home is the best place to get down to business. When I was in the gym I was constantly distracted by others or hindered by those around me. Working out from home has improved my focus dramatically. Ever been a victim of your own ego in the gym due to surrounding pressure? I have. You’re looking around the gym and to keep up with the gym regulars you up the weight, compromising on your technique and form. The ego’s of those surrounding you get the better of you and you buckle to the pressure. At home you can exercise within your limits and make slow, steady progress without compromising on your technique. You can also have your ipad/laptop handy to record your progress. Set your own goals and stay grounded; ego’s aside of course. One negative about working out from home could be the lack of equipment or space limitations but for me this should be deemed as a positive. The gym and the huge amount of machines available makes your workouts lazy. Machines are something you can do without and working out from home forces you to look at alternatives. Using the chest press machine may be replaced with dumbbell press. Full body and core workouts can also be successfully completed at home. Within the gym environment you pay based on the equipment at your disposal when in reality it’s hardly needed. Cut your cloth accordingly or should I say adapt your work out around your home. Depending on your workout goals and aspirations the gym environment is potentially not the place for you. If you’re looking to stay fit and healthy and integrating workouts into your daily lifestyle then working out from home is certainly the right path for you. If your lifestyle suddenly changes then you can adapt your home working routine to match this. The gym environment is rigid in that it has far more barriers in integrating working out into how you want to lead your life. Most people want to maintain health and this can be achieved at home with the right focus and mentality. It also makes COMPLETE financial sense for those looking to build long term self worth.